No annual is more cheerful or easier to grow than marigolds. These flowers are the spendthrifts among annuals, showing a wealth of gold, copper, and brass into our summer and autumn gardens. The flower’s popularity probably derives in part from its ability to bloom brightly all summer long. Marigolds need lots of sunshine. 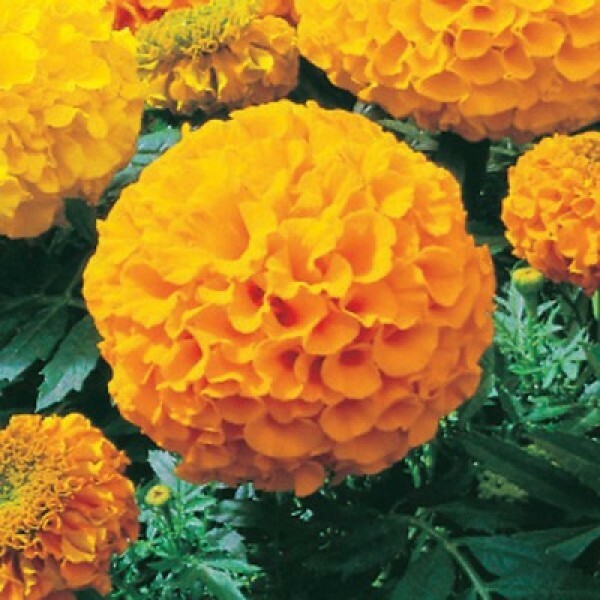 Though they grow in almost any soil, marigolds thrive in moderately fertile, well-drained soil. Separate seedlings when they are about 2 inches tall. Plant them in flats of loose soil, or transplant them into the garden. Space tall marigolds 2 to 3 feet apart; lower-growing ones about a foot apart. If planting in containers, use a soil-based potting mix. If the spent blossoms are deadheaded, the plants will continue to bloom profusely. Do not fertilize marigolds. Too rich a diet stimulates lush foliage at the expense of flowers. Marigolds bloom better and more profusely in poor soil. The densely double flowerheads of the African marigolds tend to rot in wet weather.